I’ve always struggled to understand the notion of happiness. I remember (probably) well-meaning teachers and preachers from my childhood, who would rhetorically demand things like: “How can we just go along with our merry lives when people are suffering all over the world, and right here in our own back yards? !” I internalized that survivor guilt dutifully- in fact, vaguely suffering vicariously for humanity for a long time, and questioning my right to enjoy life. Whenever indulging in laughter or playfulness, it was niggled with a sense of callousness to the “rest of the world”. Fast-forward a bunch of years and a lot of soul-searching and life experience. I’ve learned to compartmentalize. I’ve learned about context and calibration. I’ve learned that being chronically, ideologically miserable about problems I can’t immediately solve, helps no one. I’ve learned that happy people who invest in mindful, judicious self-care tend to contribute more to the world than those mired in righteous indignation and victimhood. And I’ve learned a lot about different flavors of happiness. 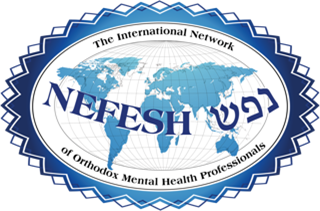 A few years ago, a young therapist posed a question on the Nefesh Orthodox professional forum, asking for ideas of how we maintain hope and happiness while working with pain for a living. The excerpt below is from my reply. There are many different "flavors" and stages of happiness. The unadulterated glee of a laughing baby or toddler. The curious excitement of young children, the ambitious optimism of idealistic young adults. When we're little, most of us learned of a world that was mostly good and safe- the dialogue, TV shows, books, to which we were exposed, created a vision of near-utopia, where the good guy always wins, and kids can sleep safe and sound. To some extent, children need that sense of security. As we get older, and confront more harsh realities, we struggle to make room and sense of it, within our schema of "good world". From skinned knees and mean teachers, to breakups and financial worries, to illness and tragedy, life brings ample opportunity to learn how to cope with negative experience. Most of us do alright with the "regular stuff", but struggle more with the bigger crises; personal and/or global. This is where my theology helps me. The more suffering, pain, and "unfairness" we see, the harder it is to stay happy and see the world as good. Unless, this isn't all there is. As a kid, I heard in school about being in "exile" but to me, it didn't feel that real or bad. Psalms, with its frequent references to our evil enemies trying to kill us, felt very dramatic and unrelatable, as did the blessings in Shmoneh Esre addressing exile, suffering, oppression, and redemption. Then I grew up. I now feel our exile acutely. Exile means a world not yet corrected. I witness severe human pain firsthand. Mental health is in exile. Physical health is in exile. Marriage, and the institution of family are in exile. Education is in exile. Religious leadership is in exile. Whenever I get that indignant or hopeless feeling of: "This is not how it's supposed to be!" I reply to myself: "Right, this is not how it's supposed to be; this is exile, and exile hurts. That's why we pray for redemption." Being in exile doesn't obligate us to be constantly upset. There are times set aside to focus on that emotional experience; like in parts of prayer, fast days, and the Three Weeks. In particular, there are parts of tefila that speak to me as a therapist: "purify our hearts to serve You in truth" "see, please, our suffering" "want our serenity” “place upon us peace, goodness, blessing, grace, kindness and compassion" and "a great love you have for us" to quote a few. Being in exile gives context to our sense that all is not ok. It is a catalyst for striving for tikkum olam (world rectification). Dennis Prager often, correctly, says: "The happy make the world better, and the unhappy make it worse, and so it's a moral obligation to try to be happy." Part of striving for tikkun is striving for happiness. But not the naive, ignorance-is-bliss happiness of childhood. Mature happiness includes the perspective and acknowledgement that we are not living in the ideal setup. But that even when and where we are, there is much to enjoy, much to achieve, and in which to take pleasure. To recognize the value of human life and potential, the capacity to persevere, the gifts and resources at our disposal, and how we can use our privilege to better mankind. Mature happiness is not giddy, but transcendent, not frenetic but patient. And mature happiness is not effortless. It's far easier to be angry, sad, resentful, fearful when confronted with suffering and injustice. Mature happiness requires much work, introspection, grappling, and sometimes research or help. Mature happiness accepts the ebb and flow of existential angst and tranquility, but with the stable awareness that “this too shall pass”, and that there is always more to the story, that G-d has a plan, even if we can’t understand or appreciate it. It’s so much easier said than done. And I’ve definitely not done it completely myself yet. But when these moments of inner peace are attained, they can yield endurance and productivity. Knowing all this, doesn't mean we won't struggle with the pain and questions. It just means we have a framework with which to address them. And that we know, we're in exile, and exile is temporary. It doesn't feel good, and we’d never ask for it, but it's part of the plan. Mature happiness doesn't resist or deny imperfection; it acknowledges it, feels it, absorbs it, and still moves forward with hope. There are hard times. And better times. Some we can impact and for others we can just show up, in person or in prayer. Mature happiness is wise, resilient and empowering. This construct also helps me understand why we read such an ostensibly depressing Megilla on the holiday called: The Time of Our Joy. In Ecclesiastes, which we read this week, King Solomon repeatedly asks: “What benefit is there for all we can do under the sun?” Some interpret this as a rhetorical surrender of hope. Yet others read it as a sincere quest for meaning. He repeatedly refers to this world as Hevel. This is usually translated as “vanity” or “futility” but in fact it means “air.” Not air that floats around us, (that is “avir”) but specifically air that is respirated by humans. This world is like air- it’s not inherently good or bad, but what we do with it. We’re coming off the intensity of the high holidays, and counting the literal and figurative harvests of our year. We could be wrung out with worry about how we performed on these days of awe, what the upcoming year in fact has in store. But G-d says no, at this point, we are finished with the fasting and the chest-beating; there is “a time for everything” – and now we are to challenge ourselves to feel joy. Not the joy of oblivious frivolity, but one deepened and humbled by the knowledge that we’ve sinned and tried our best to repair. We’ve encountered another full year of laughter and tears, and we could get bogged down by the rain, but we choose to seek the sun. This holiday kicks off the year with a theme of personal growth- we begin with self-care: purchasing fine clothes and food, to embrace material comfort and pleasure. We build a Sukka topped with organic materials, to symbolize G-d’s loving embrace and protection. We take four species that grow from the ground, and represent the various functions and types of humans. We show that we are looking upward and onward, we sing Hallel. We put the past to rest, and we celebrate with loves ones. We choose joy.